I hope you are all well and for those not feeling so good I send hugs out to you all. I haven't been blogging much lately, this is due to a number of reasons. July and August are always really busy here with lots of people visiting and staying over ~ not to mention an assortment of doggies who we have been looking after while their owners go away on holiday. Also, I have been concentrating on the final push to sort my craft room out. As anyone who has followed my little blog for a while will know we had a HUGE amount of work done on the house a couple of years ago and every room in the house was affected (whether it was having work done or not). The aftermath was complete chaos, lots of things had lost their home and one of these things was my craft stash, previously housed in a very large cupboard at the top of the stairs. The cupboard now houses our very large hot water tank and is my airing cupboard where towels and bedding are stored (the airing cupboard used to be in the bathroom). The only sensible place to re-house the craft stuff was in the study, which is where I do my crafting anyway. Trouble was it wasn't fitted out to store craft items and also houses all our household paperwork, books and company paperwork (hubby being self employed). This has taken a lot of head scratching and shopping around for storage that would fit into what was already there and there have been a few changes of heart along the way, there has also been a large amount of clearing out and a lot of sales on eBay! I am glad to say though that I am nearly there ~ I was finding it very hard to be creative when everything was piled up everywhere and I didn't know what I had or if I did where it was ~ very frustrating. So, on to today's share ~ now you know how soft I am about my dogs (in fact all animals) well this is Sorrell's 10th Birthday card ~ her Birthday was in August. 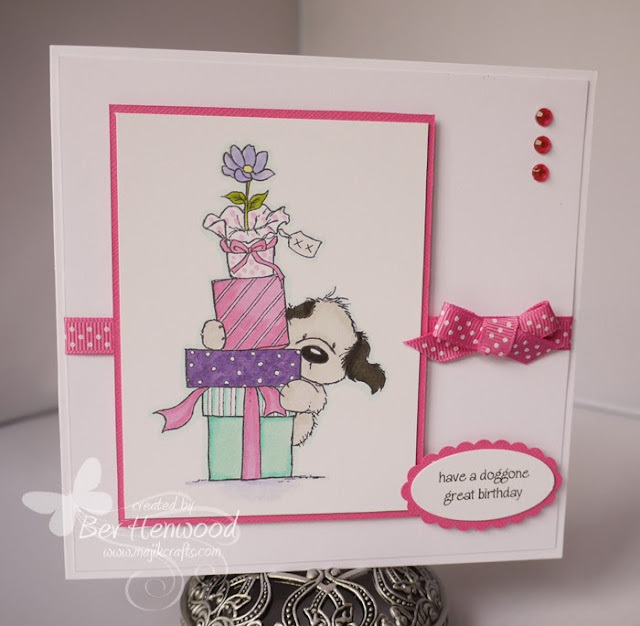 Sentiment: I was going to use Wild Rose Studio ~ 'Dog Greetings' but unfortunately when I took the stamps out of the packet they just disintegrated!! So, this sentiment was computer generated. I hope you like it ~ Sorrell enjoyed her Birthday and had a new squeaky ball and a muffin with a candle in it. Thank you so much for stopping by today and for any lovely comments you make. Love this card. The doggie looks a little like a beardie. Mylo also likes squeaky balls. He carries them around all day untill we get crazy of the noise and put them away for a while LOL.